Do you want that Bloodwood to stay red? Osage Orange to stay yellow? Cocobolo or Tulipwood to stay rainbow colored? In my younger, more naive and delusionally-optimistic days of woodworking, I was immediately drawn to the intense colors of Padauk, Bloodwood, and Purpleheart—as many of us are. I imagined colorful creations that I could make that would endure for years. Despite reading multiple reports of the color in these exotic woods not lasting—and actually turning dark brown—of course I knew that the rules of the universe didn’t apply to me, and that somehow, I would beat the system. And so I cranked out some amazingly colorful creations with exotic woods, and do you know what? They looked fantastic. And again, in my usual state of delusions, I reckoned that these colors would last forever. They had to. They looked so good. It had already been, like… three whole weeks, and no noticeable change in color had occurred, so what could any further ravages of time possibly do to my wood creations? As it turns out, plenty. I remember showing someone a section of Pink Ivory on a project that I had completed several years ago, and said, “Check it out, this is Pink Ivory. Amazing, isn’t it! ?” The person, with an unbiased (and unimpressed) response said coldly, “but, it’s brown…” And then it hit me. That Pink Ivory was pink at one time, but the color had faded so gradually, to my delusional eyes it still appeared pink, when in truth, it had become an ugly brown. Here’s my take on wood color: every piece of wood has a “freshly-cut” color, and also a “settled-in” color. Yes, most woods tend to get darker over time, but it’s not limitless: i.e., all woods do not continue to get darker and darker until they become completely black, they eventually stop at a certain hue/shade; this is what I’ll refer to as a wood’s “settled-in” color. The problem arises in that we can only see the initial color of the wood, and have no idea where the settled-in color of the wood will end up. 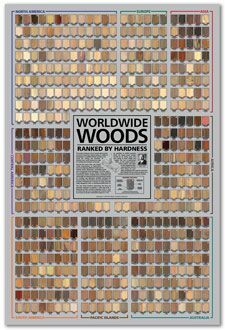 Imagine how differently you’d buy and use woods if you could only see the final color of the wood! Now, we can play games, and do certain things to slow this progression (see tips below), but just realize: you are only slowing the inevitable. The wood is in the process of oxidizing and shifting in color, and it will do so sooner, or it will do so later, but it will still happen. You can adopt a “it was fun while it lasted mentality.” Chances are, most wood creations give the most enjoyment during the first few weeks or months of ownership, after that, people just sort of take things for granted. If you’re of the personality type that’s highly bugged by these sorts of things (you want to make heirlooms that endure for generations), then learn to use woods that get better with age, (such as Cherry, Mahogany, Oak, etc.) and time will be on your side! Don’t be delusional. It really is only a matter of time. Like so many other things in life, you are not an exception to the rule. However, if you’re already in the midst of a project, and you want to make the best of it, see the tips below. Be sure to use several coats of finish to block out as much air/vapor as possible. Studies have shown that the more coats of finish that are used, the less the wood is effected by changes in humidity. Using a simple rub-in oil finish or paste wax offers very little resistance for the wood; you’re after a film-building finish. As an extra precaution, you can use an exterior-grade spar varnish with UV inhibitors. If you are trying to maintain the color of a light-colored wood, such as Maple or Holly, use a water-based finish, or a finish that doesn’t yellow with age. Bloodwood 2 Turns a very deep reddish brown—almost black. Chakte Kok 1 Turns brown fast, but doesn’t darken. Jarrah 2 Inital color isn’t quite red, and settled color isn’t great either. Tulipwood 3 Colors desaturate and shift toward brown, but maintains contrast. Cocobolo 2 Colors can darken to nearly black, sometimes contrast is maintained. Padauk 2 Turns a very deep reddish brown (lighter pieces turn brownish gray). Brazilwood 3 Initial color isn’t always great, but retains colors slightly better. Chakte Viga 3 Initial color isn’t always great, but retains colors slightly better. Buckthorn 3 Starts pinkish orange, slight shift toward brown. Canarywood 3 Colors tend to desaturate to shades of brown, still maintains contrasts. Osage Orange 1 Drastic changes toward dark brown inevitable. Tatajuba 1 Not great color to start with, not great color to end with. Yellowheart 4 Retains color fairly well, though some browning occurs. Lignum Vitae 2 Darker pieces can turn nearly black. Verawood 4 Retains olive color well, may actually increase in coloration over time. Sumac 3 Colors desaturate to a more neutral olive-brown. Pistachio 3 Colors desaturate to a more neutral olive-brown. Blue Mahoe 3 This wood is not blue, it’s a cool gray at best. Dyes give a true blue. Purpleheart 2 Gives a good run for a while, but inevitably turns brown/black. Bois de Rose 1 This wood is the worst. Expensive, endangered, and turns really black. Katalox 3 Already nearly black, it is more suited for black than purple. Kingwood 3 Starts a reddish purple, shifts toward brown/black. Maintains contrasts. Pink Ivory 1 Turns brown fast, but doesn’t darken. Tasmanian Myrtle 3 Initial color isn’t the best, but only slight shift toward brown. Box Elder 2 Much of the color fades to brown. African Ebony 5 Starts black, stays black. Wenge 3 Starts very dark, can actually lighten over time. Panga Panga 3 Starts very dark, can actually lighten over time. African Blackwood 5 Starts black, stays black. Avoiding direct sunlight definitely extends the color life. I made some engraved coasters for a number of people last christmas that had some paduk trim that all came from one piece. My dad’s sits in the living rooms with skylights as is now a dark red. My other friend who lives in an apartment with few windows has one that still looks much like it did when it was new. Color stays if you boil the wood in parrafine(wax).Beware of the dangers thogh ,because boiling parrafin wax plus a little water results in a big bang and a mushroom cloud.The disadvantages are that the wood piece will never adhere to any glue after.Another interesting sealing method is with waterglass(wood infusedwith glass) altough it got a bad reputation lately .These methods would prevent deterioration only from oxidation and to a little extent against UV light. I never finish my pens or other wood projects with cyanoacrylate as I don’t want a plastic pen. I want a wooden one. I want to feel the texture and see it age and develop a patina over time and use. I see this issue as related. Yes, my purpleheart pen will fade to a dark aubergine over time. It won’t last forever. All the more reason to treasure it now. Like a beautiful woman in her eighties, the beauty may have faded somewhat on the outside but deep within she’s still gorgeous, even if much of the “beauty” exists in memory. If you want something to stay red or purple or yellow or whatever colour forever, use acrylic or plastic. Otherwise embrace the natural decline as being the exact aspect that gives this material its true beauty. Boil the wood in parrafine and will last forever and still feel like wood.Its dangerous to play with boiling parrafine thogh and you must know what your doing. HALS: hindered amine light stabilizers, which trap the breakdown products (free radicals, reactive oxygen) from UV exposure. BASF’s Tinuvin® is a family of products which could be very useful additions to many wood finishes. TransTint dye is not for exterior, what do you recommend to use for exterior? As a scientist/engineer I can confidently say that no polymer, wax or organic coating (that is any normal clear coating) will block oxygen or moisture on a timescale of months or years. This is why buried cables have metallic layers (which can) to stop them filling with water. Clear moisture-and-gas-blocking alternatives include silica glasses and diamond but these are hardly practical. But I think that all preventable (that is surface) darkening effects are actually about blocking light, especially uv, and coatings can block this. I do not especially see why tougher-seeming coatings like acrylic might be more effective, except that they are thicker. It would be interesting to know whether the clear inorganic nanoparticles in modern sunscreens (often titania), which should be stable and permanent, could be incorporated into wood coatings. Aren’t you a bit pessimistic? As a fellow engineer and material science enthusiast, I’d say that your analogy to buried cables is a bit ridiculous. Epoxy is completely waterproof and some varieties are UV resistant/blocking. They are very commonly used in marine applicaitons including wood boats. Plenty of stains already contain UV blocking oxides that you mentioned. No not at all! Being ‘waterproof’ for a boat just means not leaking. Waterproof for a wood coating just means that the short-term diffusion is small – if they were immersed the water would in time diffuse through, as would Oxygen. They normally look dry because they normally spend most time in the dry, but all wooden items, even if polymer/wax coated, will adjust to the average local humidity over time. Thus changes in colour over months or years that can be stopped with coatings must in fact be light-, not oxygen-induced. And yes, there are UV-blocking coatings, the question is do they degrade and stop blocking. Inorganic coatings probably do not, most others are likely to. I remember watching a video by Matthias Wandel where he briefly mentions that plastic isn’t nearly as effective as metal in moisture exclusion, and gave the example of the insides of potato chip bags, granola bars, etc. — the plastic bags are almost always lined with a metal/foil to help preserve freshness. You are exactly right – even a thin metal layer can block gas and water diffusion, hence indeed metallised crisp packets and Helium balloons (I remember the very short usage lives of He-filled rubber balloons). Clear diffusion-blocking layers exist (think silica, nitrides & diamond-like carbon for example) but are not easy for wood, and would probably crack with wood movements anyway. Note that water is actually a very small molecule that diffuses fairly easily – water is only a liquid at room temperature because when in liquid form it forms larger molecular groups. Epoxy isn’t as waterproof as you may think. The barrier coats they put on fiberglass boats, to keep water molecules from penetrating the gelcoat and forming blisters, have to be applied in several (4-5) coats. The recommended thickness is up to 10 mil. 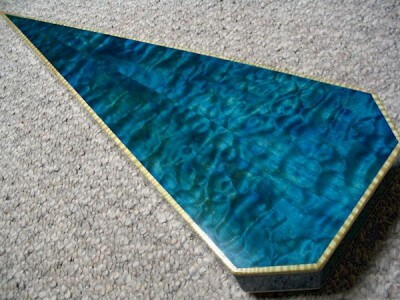 And this is on a one-piece fiberglass hull. Guitar factory worker, here. I can confirm that most issues are due to exposure to light. Very easy to see in the sometimes poorly stacked first pair of top/back/side panels on a pile. In a matter of weeks, everything from rosewoods to mahogany & cousins to cherry to maple will show where the light was hitting. Mind you. this is inside with limited natural light (probably with UV blocking dopants), so in the sun it might take just an hour or so. The whiter softwoods are not very affected. The appeal of cocobolo is in its beautiful grain, not bright colors. If this fades, it would be a huge waste, and no dye will be of any use. Do you suppose a UV blocking deck oil followed by UV blocking epoxy finish would keep cocobolo looking good? Hi, I just want to comment on a few replacements forforperson some of those evil red looking woods, like redheart and cocobolo. I would suggest using either red cedar heartwood, which, when finished, looks anywhere from a deep red, to a lighter purple-red. 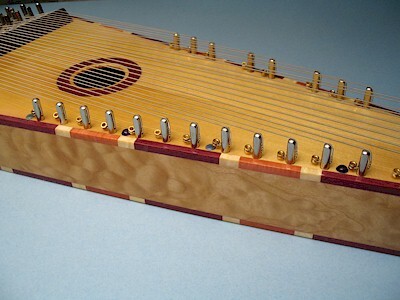 I also would suggest the red cedar heartwood for a replacement with some purple woods, too. The other wood that I would suggest is plum. Plum can have beautiful red streaks in it, however, not always, but is one of my personal favorites to work with. The only issue with plum is that it is VERY hard to find commercially, and isn’t found in large thicknesses. Just a closing point, if you want to go cheaper, go with cedar, but make sure to see it in person (all cedar is different shades of red and purple) but if you want to have an artpiece of its own, go with the much more rare and expensive plum. 4. that the only perfect preservation technique is to keep the piece in a closed box until use / displaying for friends. 5. In the case of figured/colored-wood cutting boards and food trays: No UV protectants should be used at all but sanding periodically followed by oiling will restore color and fine finish (and this is why one should consider thick boards rather than department store offerings). I found from numerous sources that Box Elder, for example, is said to hold its color better than most species. It loses color in an indirect sunlight environment of a typical dining room over a period of 5-10 years; a multi-window living room in half that time. I read various opinions: Articles asserting that any species’ color duration can be extended to perhaps as long as twenty years to a lifetime with Armor All application topped with poly. Products like Armor All, especially the non-oily product Outlast can be used with or without wood stabilizer in the wood. Color duration can be extended perhaps into an heir’s lifetime or several generations using the technique of totally shielding the piece in a box or under a thick cloth when not on display, depending upon amount of UV exposure during displays. Thanks, James, though I am saddened to learn the reality about box elder in particular. I do suspect, though, that the various articles and blog items to which I referred around the net are accurate. If so, and I also have some of my own experience (more in a moment), I stand by the numbered techniques I offered earlier. I especially emphasize telling the consumer that their “special” pieces you sell or gift be kept out of sunlight even though you took treating steps, such as starting with Armor All. Consider this: You might even use this “sad news” disclosure to sell a container box or cabinet as a supplemental sale; owner takes piece out to display then later replaces into total darkness. It’s certainly ethical to disclose the problem prior to sale anyway, and that sets you apart from most vendors. Recent experience: One year ago, I made a flaming red/yellow boxelder dragon-head bookend for my niece (more red than most segments view at CarolinaCustomMade.com/products.html . Somebody tell me how to post a before/after picture here please). I told her and her mom about the discoloration problem. I used four layers of poly, each a tad thicker than one might normally use. It has been in the corner of their living room for one year, receiving indirect sunlight from three roughly 5’x5′ windows (not UV enhanced). I noticed recently that the red had bleached to about 80% of original intensity and the yellow had dulled similarly. At this rate, it will fully blanch in four to five years, which is the estimate I told them a year ago. So, perhaps with some pieces the red that the tree secretes (U of Minnsoooota study found that this red is a secretion of the tree in response to the infection, not a secretion of the fungus). For all you Minnesota fans wondering whether this study was authoritative: “Well, yer darn’ tootin and ‘hey, soooweather’s gettin’ kinda cold, eh? Have some mooore coffee, then.”. Anyway, back to wood: I will soon experiment with the new Armor All product to determine whether more than one soak-in / wiped dry application will still allow poly to adhere reliably. Glad also to share or learn of experiments from y’all (what’s the plural of “y’all”? “all y’all!” of course). My jury is “still out” re the fusarium vs. secretion debate…sometimes the botanists (for whatever reasons) leave out the reality that it is notoriously difficult to make iron-clad declarations re the interior machinations of trees, due to the (current) impossibility of actually getting into the tree to determine what’s going on…I compare this to the plethora of misinformation re figured woods, burls, etc. (eg. “burls are diseases”, “birds-eye maple comes from birds pecking at the tree”, etc.) trees still hold some deep mysteries, which they are not yet ready to reveal…checked out your pics, nice work! I would be interested to see just how long that horse will keep its reds, for sure…another one is what I call the “pink ivory” of the flowering crabapple trees…several varieties of these trees produce wood (in sapwood only, twigs-branches to maybe, 3″ diameter) that, when freshly cut, are the most purple-pink you’ve ever seen! Then, as the wood dries, 90% of it goes away with the water…had such a tree in a rental home years ago, Arborists pruned it in winter, I gathered these branches, waxed them, all excited, then watched them fade to pretty much nothing, as they dried out over a year or so, lol! Well, the LOL is on me, as what you thought was a horse head was actually a dragon head (waterhorse, perhaps)! Best to you, James! Most of your mistakes come from not treating the woods with the appropriate solution of acid/basic solutions. You have to experiment with a lot of substances to find out. Bus as an example purple hart turns hot pink when washed with muriatic acid. Take notes of times and percentages in distilled water, then age the test pieces in thew sun, with and without different varnishes. The PH of the wood ( and therefore its colors) may change just because you have not tested the substances you put on them. Even your sweat can interfere. There are antique pieces that still retain the colours, why ? because old times knew what I am telling you now. Also natural shellac always takes the best out of marquetry pieces. So now you know, the trick is in the PH . I am curious if beeswax might help keep the purple in the purpleheart wood? I like to make lucets and in Medieval times they would use melted beeswax to treat their wood objects, drinking vessels, bowls, etc. I have used beeswax before and had good results, though it takes some use before the wax feels good to the touch. It does give wood a nice waterproof and slightly shiny sheen with use. It does go a shade or two darker in the process though. So I am curious what you think? Thanks. What of the Color-fasting of “European Hornbeam” and “Steamed Swiss Pear”? Also, does the Madagascar Violet Rosewood (“Bois de Rose”) retain a degree of purple glow even when it’s at its stage of “really black”? I’m new to wood, so I have little experience myself. What of the color-fast rating of “European Hornbeam” and “Steamed Swiss Pear”? Also, does the Madagascar Violet Rosewood (“Bois de Rose”) retain a degree of purple glow even when it’s at the point of “really black”? I’m new to wood, and so I have little experience in any of this. Old yew lutes from the 17th century have turned from pink to a warm golden brown: it takes a certain time but exposure to direct sunlight will quicken the process in only a couple of years. Black locust turns from a light golden color to a deep chocolate brown not only when exposed to UV but even when slightly heated (sun, iron, steam etc). Rotary cut black locust is only sold in deep brown , since the logs are steamed . My father and I made a Hat Box (military Chief thing) out of purple heart, paduk and ash with a few slivers of zebra wood. Boy was she GORGEOUS. For about a year. Now four years later the box is brown on brown with pretty ash and zebra wood being the only elements that endured. I should have saved a ton of money, bought regular hard wood and stained it the pretty colors. Thanks for the info especially since I use the natural color of wood for a lot of the work I do. I will have to disagree somewhat regarding blue mahoe being cool grey and not blue. I’ve used it quite a bit and find that while it’s definitely not BLUE! !, it is still distinctly blue compared to anything else. I’ve attached some pics where I’ve used it (all the color you see in all woods is natural). I’ve found the best way to bring out the blue color is to orient the grain horizontally and light it from overhead; this maximizes its blueness. Vertical grain orientation or direct lighting pushes it towards looking brown. Another consideration with blue mahoe is when you purchase it – it can vary in color from cream to blue to brown and you have to be careful what you buy, especially if buying from an online vendor. You need to be very specific in telling them you want a piece that is blue and not brown or cream or whatever. Ask them to send you a picture of the exact piece you’re buying. What kind of UV inhibiting finishes would you suggest I use? I am building several furnitures for my house using poplar. I loved the beautiful greens and purples it has and that is why I chose this wood, but now I learned that these colors are going to turn brown and I’m disappointed. I would like to keep the wood light and natural, almost white (maybe even do a water-based white wash). What kind of clear coating should I use that will not turn yellowish and will keep the green color as long as possible? I used to use a product called Behr Tung oil, which had uvi inhibitors; what I found is that the colour change in the Y. poplar was pretty proportionate to the degree of uv exposure; i.e., articles/furniture ending up in a basement with no or very little sunlight, will retain the colours almost indefinitely, if finished with a finish w/uvi…if it’s, say, upstairs in blazing sunshine, there’s really not a lot (at this point in time) that can be done…Re finishes in general, remember that differing finish option/formulations often have differing results/effects on wood colour/appearance. Examples, water-based finishes tend to look slightly anemic/bright on whiter woods like maple, oil-type finishes tend to cause a “murky” look on some species, while fast-drying “nitro” type finishes ten to preserve colour and “flash”…. So, what I suggest: make some small samples (anything with up to 4” of area is fine) of y. poplar with the different colours you like, and then finish them with a few different finishes (make sure they all feature uvi), and then “test” them in your home environment, by just leaving them exposed, and see what they do…ideally, the longer they can be tested/observed, the better idea you will have of how they will look in finished furniture…not sure what your timeline is, but I would think a minimum of 6 months observation of the samples would give a good estimation of how well the colours would “hold up” over time…. Hi Roman…I just noticed your pictures… …athough I have read the above article a few times previous. Those are some nice plaques you have done there… Are you involved with Olympic Rowing in some way? My father was on the 1948 – 8 man team that beat out the British on their own river & took the gold! I have been fairly interested in the sport from a young age as a result. Afraid I seem to be in a minority in that. Will Wood stabilizer preserve coloration, such as with boxelder. I really need to permanently preserve that red and yellow. Must I encase it in resin? That post on using Son of a gun dashboard spray? I’m in a wood turning club and a guy gave a wood turning demo and said to use Armorall dashboard spray, must be the(original) then use a coat of shealac and then any thing you want on top of the shealac, he said this will keep the color. Great! TY. One more question: Will a decades-dead boxelder tree keep its red spalting on the yellow pulp due to no sun penetrating the tree? I ask this to determine whether to fell some that I have identified, and I do not want to take on useless work to fell a tree that, being dead decades, is likely to have grayed out pulp. Thanks! Now THAT makes me sad! So the Armor All dashboard trick is bogus or brief in its effect? Is the only method that helps keep the red (other than keeping it in the dark) the technique of meticulously painting the red with some sort of dye or red stain so that the natural fades but the artificial remains? Re the “Armorall” technique, I have heard of this, but have never tried it, so I can’t say (must try it, sometime! )…re painting/dyeing, I think that, to avoid a garish/artificial appearance, painting/dyeing could be used in an obvious way, or the piece can be left “natural”, and left at the mercy of time (and the SUN! ), but to try to mimic the red spalting w/dyes would be very difficult to achieve a natural look…in this connection, bear in mind that there is always a contrast between natural colours and artificial (years ago, for a craft sale, I covered my table with a green plastic tablecloth, and all my p’heart, bloodwood etc. creations turned into visual mud! )..this contrast can be used to advantage, it just depends what one is trying to achieve (I’m thinking for example of the woodturners who paint their turnings when they are done…)…I’m more of a “purist”, I like to work with the natural colours as best I can…I “stretch” that aspect, by using heat (like on p’heart, which deepens/darkens the colour and sets it so it won’t fade) and natural alterations, like fungi, spalting…re the boxelder, I think it is sunlight that is the main culprit here…items made with the red, and kept, say in a room/area with no windows..but again, as Erik rightly says, you are “putting off the inevitable”…I have found re boxelder, that the orange colourations seem to be more “coulour-fast” than the red….last comment re the red boxelder, depending on the context of the piece, a light re-sanding does bring back the colour, temporarily, of course….cold comfort, but what do you do, while we wait for that ultimate finish that DOES truly block UV? A related issue for marketing materials, if you create these, is estimating color-fast duration, and this is not well known with these techniques because exposure to UV varies by room, thickness of finishes, lack of formal studies, etc.. But one could inform the consumer of general estimates found on the internet among woodworker/carver blogs: For example, I found from numerous sources that Box Elder is said to hold its color better than most species, losing it in an indirect sunlight environment of a typical dining room over a period of 5-10 years. I read various opinions * articles asserting that this duration can be extended to perhaps as long as a lifetime with Armor All application topped with poly. These can be used with or without wood stabilizer in the wood. Color duration can be extended perhaps into an heir’s lifetime or several generations using the technique of totally shielding the piece in a box or under a thick cloth when not on display, depending upon amount of UV exposure during displays. With purpleheart I found that if you sprayed “Son of a Gun” or something like it on the wood that it protects it from UV related issues. Son of a Gun is the stuff you spray on the inside of your car to protect it against damage/color change from the sun. I got this tip from an older woodworker that has been doing this for years. You can also use head to change the color of purpleheart to what you want and then seal it. I would give it a try. I think it would even work with other woods. You said you can use “Head” to change the color of purpleheart. What is Head? I think he meant ‘heat’. Probably cell-phone auto-correct! Try baking at 300 degrees for 30 minutes. Use foil to catch resin drips. Also, makes a stink. Heat sets the color. African Sumac pulls an interesting trick. The wood has a very light creamy colored sapwood and some reddish tint to the heartwood when you first cut it. But, leave it out in the sun and it all turns a really pretty ruddy red color and seems to retain that color very well. I’ve made a couple small knife handles out of it and used a very basic oil rub on it. Takes stain well enough on a test piece but give it a sun tan and a clear finish over the top. Fairly soft if I had to venture a guess. You said “It” works great with Purpleheart. What is “It” you are referring to? Thanks. Eric, the Wood-Database is very helpful and informative online asset. thank you for all of your work providing such a valuable resource. hey thanks for the answer. I stripped the granadilla and rubbed it with tung oil. It seamed to cure better, so I rubbed in three seperate coats. I did a very gentle sanding with 1000g and then rubbed in a beeswax wood conditioner. I couldnt be happier with the results! so I tung oiled the Padauk and it cured very nicely, so I sprayed a coat of spar over that and it seems to have cured completely! Maybe the tung oil seals in the oils and doesnt allow it to react to subsequent coats of varnish? I’ve had the very same trouble that you describe. In my experience, it will never dry. In my case, I had to strip off the tacky finish and try again. I surmise that the oil(s) in the wood interfere with the curing process of the finish, and prevent it from setting up properly. What I’ve found that works is if you seal it in several coats of shellac first (you can also buy Zinsser’s Seal Coat if you don’t like/want to mix your own shellac), and then apply the poly or spar urethane over top. I found that one or even two thin coats didn’t fully solve the issue, and three medium coats seemed to be enough to prevent the gumminess. Im having trouble with spar urythane drying completely on granadilla and padauk. It just stays tacky. I coated some acacia with the same spar at the same time and it dried nicely. Does it take longer to dry on the other woods? Will it ever dry completely? Thanks Eric. Great news. I’ll leave it out exposed for a week or so and see what happens. That’s a great question. From what I’ve read online, the *good* color change in Purpleheart is just about unavoidable, and will shift regardless of the finish applied or exposure to light. Great article. I have created a Purpleheart woodturned pen. One of the troubles with Purpleheart is that you WANT it to get that ageing look to it, turning it a deep purple. I didn’t notice your article before turning the pen and finishing it with several coats of thin Cyanoacrylate. Will Cyanoacrylate inhibit the natural shift to the purple colour? If so, I would be inclined to sand it off and allow the wood to age naturally, then coat it. Thanks in advance for your reply. Simon. colored woods..especially the reds, purples and oranges. Please note: an exception to this appears to be Pink Ivory, which seems to thrive in conditions of exposure to light and air. Thanks for the article on gluing exotic hardwoods. It was precisely what I needed for a turned urn project where the customer brought me the woods he wanted to be used. I have no option but to glue Cedar to Goncalo Alves. This will help immensely.